Hey Trib, The Dodgy list was first – and better. A week after I posted my own, the Chicago Tribune today had their own list of smart-alec ideas to replace the Marilyn Monroe statue on Michigan Avenue. Mine were much better, more creative, and more interesting. So there. Here are theirs. Followed by my reaction. Macaulay Culkin – Jesus Christ. Betty White – Give me a feckin’ break already with her. Enough. Bjork – Totally out of the blue. My favorite choice from their lame list. Rod Blagojevich – too easy. No creative thought put into this whatever. Janet Jackson and Justin Timberlake – Is anyone still talking about that? Sorry Chicago Tribune, mine was first – and better. So Neh. The headline sounds assery of me, but I’m feeling assery. Enough of that. Here is a random post from my Facebook page on Friday night when I did absolute shite. 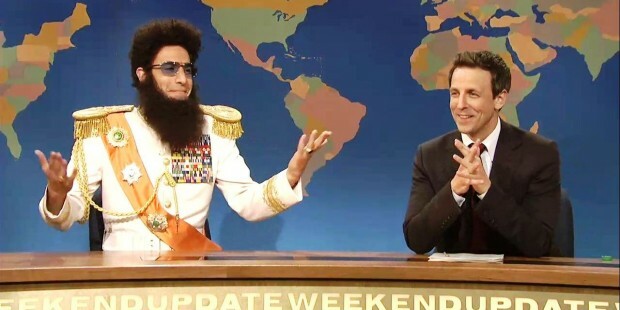 And speaking of recent posts, just after I had a call-out for Sacha Baron Cohen to host SNL, guess who makes an appearance. And he did it as The Dictator, which I thought would have worked in a sketch or two. Seeing him on Weekend Update only reinforces how much he should host the entire show. Can you stick around for the rest of the show?